RBTH presents a selection of views from leading Russian media on international events, featuring coverage of the APEC summit currently taking place in Beijing, as well as a report on ongoing talks on Iran’s nuclear program and the possibility of lifting sanctions against Tehran. The Nezavisimaya Gazeta daily gives an account of President Vladimir Putin’s meeting with Chinese leader Xi Jinping at the APEC summit, currently taking place in Beijing. The paper points out that the two countries have confirmed their intention to expand cooperation irrespective of the changes that are taking place in the world. The two leaders oversaw the signing of nearly two dozen agreements, primarily in the gas sector. 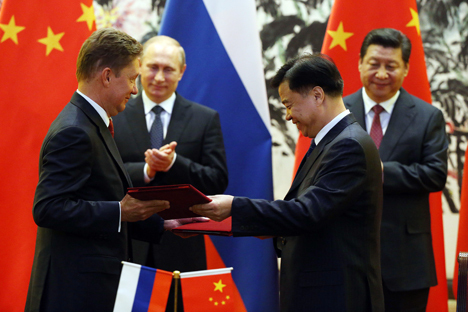 In particular, a memorandum on gas supplies to China along the western route was signed, as well as a memorandum between Gazprom and the Chinese National Offshore Oil Corporation and an agreement on cooperation between Sberbank and the China Export & Credit Insurance Corporation. Commenting on the significance of the gas deal, Gazprom CEO Alexei Miller said that in the medium term, Russian gas supplies to China may exceed those to Europe, Nezavisimaya Gazeta adds. According to a leading research fellow with the Russian Academy of Sciences’ Institute of the Far East, Alexander Larin, “Russia’s partnership with China is developing in special circumstances.” On the one hand, Russia is having to wage a war of sanctions with the West, which is leading it to largely refocus its attention on the East. On the other hand, China has considerably stepped up its efforts to expand and deepen integration processes in the Asia-Pacific region, prompted by the U.S. bid to restrain it. Meanwhile, the Moskovsky Komsomolets daily points out that Barack Obama, having missed the previous two APEC summits in Vladivostok and in Bali, this time has decided to “kill two birds with one visit.” Firstly, to demonstrate to partners that the U.S. has no intention of giving up its leadership in the Pacific region, and secondly, to have a showdown with China, which is aspiring to this leadership, the paper writes. Given the number of mutual complaints that have accumulated between the two countries, the Sino-American dialogue is unlikely to be easy, MK adds. The paper also points out that the APEC summit marked Vladimir Putin’s fifth meeting with Chinese leader Xi Jinping this year. The Russian delegation arrived in Beijing with new proposals in the energy sphere. Citing Gazprom CEO Alexei Miller, the paper explains that the proposals concern the so-called western route for gas supplies, from already developed gas fields in Yamal via the Altai into China’s northwestern provinces. The new agreements are important for the Kremlin, which wants to show to Europe that it has a distribution market for its gas that may not be in demand there for political reasons, MK adds. The Kommersant daily gives an update on the ongoing talks on the Iranian nuclear program. Citing a Russian diplomatic source, the paper says that “all the technical details of a deal have in effect been agreed” but one key issue remains unresolved, that of a procedure for lifting the sanctions that were imposed against Tehran by the U.S and UN Security Council. According to the paper, this procedure may be linked to reports by the IAEA, which last week accused the Iranian leadership of unwillingness to answer some of the questions addressed to it. Iran was the main topic discussed by U.S. Secretary of State John Kerry and Russian Foreign Minister Sergei Lavrov on Nov. 8 on the sidelines of preparations for the APEC summit in Beijing. According to a Russian diplomatic source, the meeting was requested by the American side. “For domestic political reasons, it is important for the U.S. presidential administration to reach a breakthrough on the Iranian issue, so they are pushing the others to resolve the matter by Nov. 24. However, the other members of the P5+1 group (the U.S., Russia, China, the UK, and France, plus Germany) are not set on a particular date, thinking it more important to reach a mutually acceptable long-lasting deal. Having said that, they too intend to do everything possible to meet the set deadline,” the Kommersant source said.